One dilemma businesses in Local Services face is trying to decide where to ask customers to leave a review on Google. Should they send them to their Google My Business listing or their Google Local Services ad? Update 3/28/19: LSA review counts are back up to where they had been. It seems Google will factor in reviews for LSA from users that have opted out of shared endorsements. They will likely just not show the content of those reviews on LSA profiles. Update 3/27/19: If a user has turned off “Shared endorsements” in the Google account privacy settings, the review they posted in Google My Business will not appear and it will not be factored into the review rating and count on a Local Services ad. So apparently about 50% of users have this setting off and Google recently removed reviews from those users from Local Services ads. A good practice, if you’re able to implement it, is to have customers that found you via Google Local Services leave a review there. If they found you elsewhere then have them leave their review on Google My Business. If it’s too much trouble to sort out how a customer found you and where you should send them, just directing everyone to Google My Business to leave a review has been the best recommendation. Why? Reviews posted on Google My Business count toward your rating and overall review count on your Google Local Services ad. Reviews you receive on the Google Local Services ads platform, however, do not count toward your rating or overall review count on Google My Business. Won’t Reviews Be Combined At Some Point? Local Services reviews will be combined with other reviews across Google in the coming months. But that line has been there for over a year. At this point, I don’t think it’s going to happen. I don’t see this as being an area of high priority to Google. It may be too complicated for them to implement anyway. 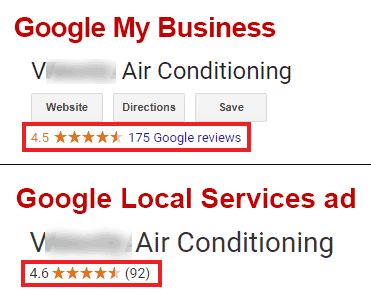 Recently I noticed that review counts on Local Services ads are lower than they are on Google My Business. Up until now that was a rare scenario and would typically only happen if a business was going all in on LSA reviews, sending their customers to leave a review there instead of Google My Business. Since Google My Business reviews would impact the count on LSA, the count on LSA would usually be the same or higher than GMB. For example, if a business received 100 reviews via Google My Business and 5 reviews via Local Services, their Google My Business listing would show their review count as 100 and their Local Services ad would show their review count as 105. But now, that business would likely see the review count on their Local Services ad at 53 (or somewhere around that). I compared GMB and LSA listings for 20 businesses that didn’t appear to have many LSA sourced reviews. I found that the average difference in the review count between LSA and GMB was -47%. So a business with a review count of 310 on GMB would now have a review count of 165 on LSA. Review Quality Filter or Just a Set Percentage? What I have been unable to determine at this point is if there’s an actual filter in place that is removing “low quality” GMB reviews from the LSA review count, or if it is simply a certain percentage (somewhere around 50%) of reviews from GMB that they decided to exclude when calculating the review rating and count for LSA. Looking a little deeper at the reviews for one business I didn’t notice a discernable pattern in the reviews that were being excluded. It wasn’t just users that left a rating without a review, or users that have only left 1 review, or user profiles that looked suspicious. It would seem odd that Google would just remove a certain percentage of GMB reviews from the LSA count, but since Google has shown time and time again that they have no way of determining fake reviews from real reviews in GMB, I don’t know how else they would be deciding which reviews to remove. This was not visible on the main LSA profile view but another view that’s a little harder to get to. I am still seeing this label on some reviews, but only on some that appear to be sourced from LSA. Review Count Bug or Permanent Change? I reached out last week to try to find out what is going on but I have not heard back. If this a permanent change, businesses participating in Local Services ads will likely have to rethink their current Google review strategy. At the moment, a review on LSA will still not impact the rating and review count on GMB, and now a review on GMB may or may not impact the rating and review count on LSA.